90% gold and 90% silver coins were once used as money throughout the U.S. Many of these coins are over 100 years old! The United States’ first $20 coin denomination, known as the double eagle, was introduced in 1850 following the California Gold Rush. These gold coins remain incredibly popular among collectors due to their rich history, their large size, and their iconic Liberty Head design. Untold numbers of these coins were melted down for their gold by Executive Order in 1933, leaving far less in existence today. The Morgan dollar came into being in 1878, and is now one of the most widely collected American coins in the world. These large dollar coins have a huge, dedicated following and are desired for their 90% silver content, as well. The Morgan dollar was succeeded in 1921 by the Peace dollar, a beautiful new silver dollar that boldly celebrated the end of the First World War. The start of the 20th century was a time of change, progress, and shifting tastes. This is why President Teddy Roosevelt commissioned a new set of designs for U.S. coins during the first decade of the 1900s. These coins, listed below, still stand as the most artistic U.S. coin designs ever in the eyes of many collectors. Sculptor Bela Lyon Pratt designed the new $2.50 and $5 gold coins in 1908, and he chose an intaglio (also known as incuse) method, where design features are sunk into the surface of the coin rather than raised above it. This remains the only U.S. coin design to use this unusual technique, making $2.50 quarter eagles and $5 half eagles coveted collector pieces! President Roosevelt relied upon the renown sculptor Augustus Saint-Gaudens to redesign the $20 gold double eagle coin, considering the artist had already designed Roosevelt’s presidential medal. It turned out to be the right choice, as the Saint-Gaudens design is today recognized by many experts as the most beautiful and desirable of all U.S. coin designs. In addition to Bela Lyon Pratt’s Indian Head design, Theodore Roosevelt desired a “distinctly American” design for the $10 gold eagle coin. He again turned to Augustus Saint-Gaudens, who in turn met the president’s expectations with a unique portrayal of Lady Liberty wearing an Indian warbonnet. Due to its interesting imagery, this gold coin is highly collectible. The U.S. Mint was established in 1792, and issued its first silver coin in 1794. Its first gold coin came out a year later, in 1795. 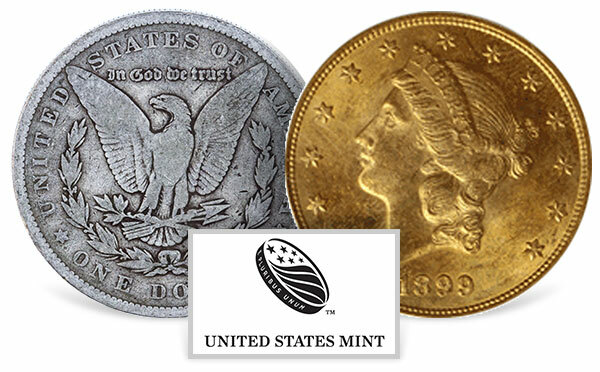 To this day, over 200 years later, the Mint is still busy striking gold and silver coins for direct purchase. Over the years, many different kinds of collectible coins have been produced by the Mint, and many are highly sought-after by collectors.